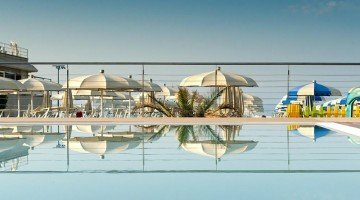 The Hotel Lina is a 3-star hotel in Misano Adriatico near the beach and in a central position. It offers international cuisine, free WI-FI connection, private parking and air conditioning. Admits small and medium-sized pets at no extra cost. 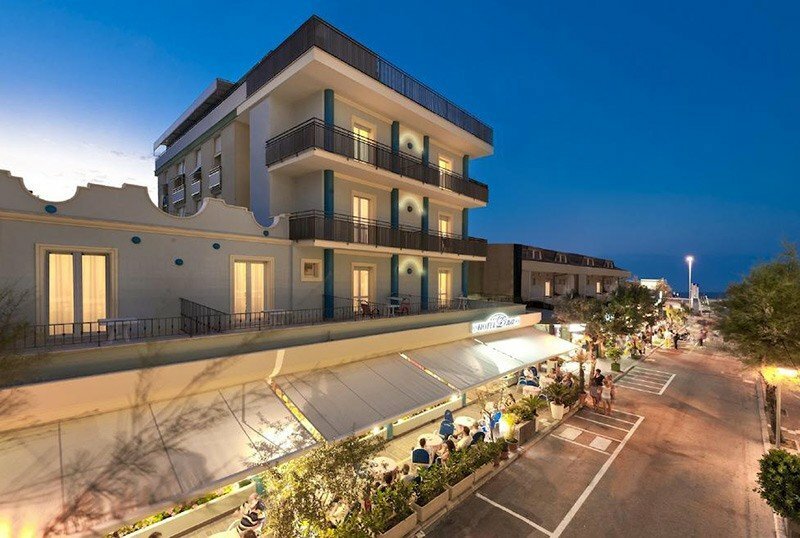 The hotel is conveniently located in the center of Misano within the pedestrian area and just a few meters from the beach. Nearby: the Riccione thermal baths, Misano World Circuit and the theme parks Aquafan, Oltremare and Cattolica Aquarium, all easily accessible by car or bus. All rooms have a balcony, private bathroom with shower, hairdryer, satellite TV and digital terrestrial, safe, WI-FI and direct dial telephone. Minibar on request. STANDARD : equipped with all the services listed. They are 14 sqm rooms with a window overlooking the mountain. STANDARD FOR FAMILY : like the previous but larger (16.5 square meters), suitable to accommodate an entire family. In addition to a double bed, they have bunk beds. MANSARDATA : rooms of about 14.5 square meters located in the attic and with views of the mountain side. SEA VIEW : rooms with balcony and window overlooking the sea, besides the services already listed are 15.5 square meters. FRENCH BALCONY : the room is located on the sea side but without a panoramic view, measuring 15.5 square meters. Outdoor terrace, free bicycles, elevator hall, air-conditioned common rooms with satellite TV, bar and reading room with newspapers. The hotel is equipped for cyclists and organizes theme nights. PARKING : uncovered and available subject to availability on request. SERVICES FOR DISABLED : entrance on the ground floor with sloped ramp, lift for disabled people. BREAKFAST : continental buffet with fruit, cakes and pies, pastries, croissants and cold cuts. LUNCH AND DINNER : 2 choice menu with meat and fish dishes and typical dishes of Romagna, with homemade pasta, always accompanied by a vegetable buffet. In hotel : live entertainment, strollers, pediatric consultation on request. At meals : seats at the table, baby food, homogenized and baby menu. Bottle warmer on request. At the beach : baby pool, entertainment, baby park, baby / mini / junior club. The hotel has an agreement with Calypso Beach, which is just a few steps away from the hotel. The establishment offers 2 hydromassages, a fitness and aerobic area, hot and cold showers, sports fields, table football, a playground area and a mini club for the little ones. The prices in the price list are per person per day. From 01 June to 04 August, family plan: 2 adults + 2 children (up to 12 years in room with parents) pay 3 full rates. 2 adults + one child (up to 3 years FREE). 2 adults + a child (up to 3 years FREE). Easter 2019 at the sea! Take advantage of the Easter offer! Special weeks for holidays to spend in July in Misano Adriatico. In Formula All Inclusive, minimum 6 days from € 360.00 per person including drinks and Beach Service. Special weeks for holidays to spend in July in Misano Adriatico. In Formula All Inclusive, minimum 6 days from € 360.00 per person including drinks and Beach Service. Special free children and discounts. Call for a personalized quote, the offer is limited to the availability of rooms. June offer at the sea for € 49 per person per day! A child up to 3 years is our free guest. Packages June and July at the Hotel Lina! From 23 to 30 June 7 days in All Inclusive from € 420.00 per person. 2 adults + 2 children (up to 12 years), in the same room = 3 paying guests!